The Ten Commandments includes the admonition, “You shall not bear false witness against your neighbor.” All parents strive mightily to teach their children to tell the truth and Mitt Romney, in the first debate with Barack Obama dissected the lies being told about his proposed policies. The journalist, H.L. Mencken said, "The men the American people admire most extravagantly are the most daring liars; the men they detest most violently are those who try to tell them the truth." The current political campaign is replete with fact-checkers, a growing doubt regarding the accuracy of polls and news reporting, and charges of lying flying back and forth between candidates and political parties. Lies do not go unnoticed. Political campaigns require people to sort out the lies from the truth and on Wednesday, an audience of millions seemed to suddenly discover that President Obama was not telling the truth as Mitt Romney skillfully presented facts and statistics that undermined his record in office and the lies he has been telling about that record. Stunned by Romney’s presentation, the Democratic Party responded with a news release claiming that he had lied. “But when the dust settles, Romney’s dozen flat-out falsehoods will be the only thing remaining…” If Romney had been lying, it would have been front-page news. It is the same Democratic Party that has run ads saying Romney is a felon and a murderer!. 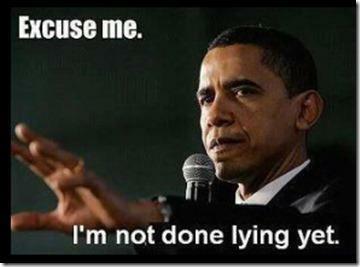 The simple, undeniable truth is that Barack Obama has set new records for lying, often when there was no need to. It isn’t just casual lying. It is pathological to a point where entire books have cataloged them and there are Internet sites that keep a record of them. During the 2008 campaign Obama claimed that the civil rights march in Selma, Alabama inspired his birth, but Selma was in 1965 and Obama had been born in 1961. He said his father had been a goat herder in Kenyan, but he had been a privileged, well-educated youth who went on to work for the Kenyan government. He claimed his Kenyon grandmother was Christian, but she was a Muslim and Christianity would not have permitted her to have been one of 14 wives. Obama even lied about his name Barack, saying it was Swahlli when, in truth, it is Arabic as is his middle name, Hussein. He claimed the school he attended as a child from age 6 to 10 in Indonesia was Christian. It was Muslim. He lied throughout the 2008 campaign and it should be no surprise that he has lied throughout his presidency. In July, Human Events published a list, “Top Ten Obama Lies”, noting the lie that his mother who had died of cancer after being denied insurance coverage for a preexisting condition, using the lie to sell Obamacare, but Ann Durham had health insurance through her employer and was only denied disability insurance. Human Events noted that Obama had claimed during his campaign that he would not raise taxes on families making less than $250,000 but “Obamacare’s individual mandate will hit many under the $250,000 mark and the Supreme Court would later rule that the mandate was a tax, not a penalty. He has repeatedly said Americans could keep their doctor, but Obamacare will cause many employers to dump their health plans and force many workers into health care exchanges. The bill, over 2,500 pages long, was passed along strict party lines and then House Majority Leader, Nancy Pelosi, told Americans they would have to pass it in order to learn what was in it! Obama promised an open and “transparent” federal government, but by mid-2011, his administration had refused to grant one-third of the Freedom of Information Act requests. Most famously, when the Fast and Furious gun-running scandal broke, Obama invoked executive privilege to protect his Attorney General and Justice Department from a congressional probe. We accept that politicians often “shade the truth” but Obama’s election and service in the office of the President was based on a huge matrix of lies about his personal life and the legislation that imposed a hugely unpopular health care law, the waste of billions on “clean energy” firms that swiftly went bankrupt leaving taxpayers with the bill, a failed stimulus, and myriad other programs. John F. Kennedy once said, "The great enemy of the truth is very often not the lie---deliberate, contrived and dishonest---but the myth--- persistent, persuasive and unrealistic." He was right. The myths woven by Barack Hussein Obama about his life and about his intentions, combined with his blaming of everyone and everything for his failures, are coming unravelled despite his co-conspirators, the Democratic Party, and many in the mainstream press. And you know, that's not an altogether bad alternative either.. This lying puddle of infected camel excreta must be defeated. This thing has got to go, and all Mitt needs to do is keep exposing the truth. Did you hear or read his VMI speech? Awesome! TexasFred's theory certainly explains Obama's recent meltdown in the debates. When faced with TRUTH, Obama wilts and fades. Barack Hussein Obama II is a traitor.